Book Your Second Grade Field Trip Soon! Calling Henderson second and third grade teachers... and home schoolers!! Are you looking for an end of the school year field trip? The Depot Community Room may be able to help!! We offer a free "Rails and Trails" field trip designed to teach those age groups about their community. Students will learn the history and function of civic organizations and buildings, like the Henderson County Courthouse and Henderson Municipal Center, Henderson County Public Library, and Henderson-Henderson County Chamber of Commerce. They'll also hear highlights of Henderson's past at the Depot, and learn more about the famous artist, John James Audubon!! The tour usually lasts approximately 1-1 1/2 hours. We are able to provide this FREE service to local school children thanks to the support of the City of Henderson, Henderson County Tourist Commission and the help of our volunteers! Call us at 830-9707 or email tamara@hendersonky.org or leighann@hendersonky.org for more information or to book your date!! Since our field trips are staffed by volunteers, the earlier we can begin making arrangements to host your class the better!! Mary Ann Fisher was born in Henderson, Kentucky in 1923. Fisher had eight brothers and sisters and lived in a shotgun house here until her father’s death in 1927. Fisher’s mother realized she couldn’t raise eight kids on her own, so the children were split between relatives and an orphanage. At the tender age of 4, Fisher was sent to the Kentucky Home Society for Colored Children in Louisville, Kentucky. Fisher left the orphanage in her late teens to start her career as a singer. During the 1940s, Fisher entered a talent contest at the Lyric Theatre in Louisville. She was slowly building a name for herself in the Louisville area, but her career didn’t really take off until she met Ray Charles at a USO club in Fort Knox. Fisher toured and had a relationship with Charles from 1955 through 1958. After her split with Charles, Fisher decided to begin her solo career. She performed in theatres with legends such as B.B. King, James Brown, Jackie Wilson and many more. Fisher returned to Louisville in 1967 and continued to perform locally. 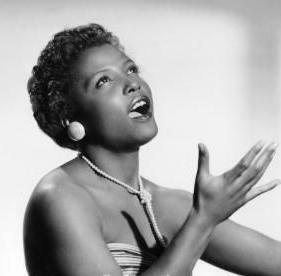 Her first album, Song Bird of the South, was not released until her death in 2004. Fisher is remembered for being one of the first African American women to have a career as a Rhythm and Blues singer, thus paving the way for future generations. Sources: The Gleaner, Henderson, KY, Sunday, February 27, 2005, “Film to cover life of local native, noted blues singer” Donna Stinnett. Please stop by the month of February to view our "Pioneers of Black History" Exhibit and learn more about just a handful of the fascinating Henderson men and women who made a mark on their community, and their world! Our exhibit features local notables like Thelma Johnson and Thomas Platt as well as some figures who lived in Henderson as children then went on to do big things in America despite informal and formal racial segregation.